Those of a certain age may remember the public-service announcement when an egg was cracked into a pan and fried with a voiceover stating: “This is your brain on drugs.” Fast forward a few decades and your customers’ brains may indeed be fried – this time by addiction to technology, stress, multi-tasking and the other realities of everyday life. Science shows you can reverse those effects through a combination of good diet, exercise, adequate sleep and hydration, socialization and the right supplements. Throw in a minute or two of deep breathing when anxiety rises to help keep things in check. The good news is we’re living longer but this also brings on a greater likelihood of dementia and Alzheimer’s disease. The number of people with Alzheimer’s is expected to nearly triple by the year 2050, going from 101 million to 270 million globally (1). Taking the right steps earlier in life can help stave off these debilitating diseases. And if it’s just those senior moments that are occurring with greater frequency, memory can be improved and brain cells restored by taking the right measures. Acetyl-L-carnitine is an amino acid produced naturally in the body. It can help aged brain function. In humans, studies suggest it could help brain function in people with mild dementia or Alzheimer’s. However, there is no research to show a benefit in otherwise healthy people. The effects of acetyl-L-carnitine (ALCAR), an acetyl derivative of L-carnitine, on memory and learning capacity and on brain synaptic functions of aged rats were examined and improvements observed. B vitamins have an important role in supporting memory loss. Folic acid and vitamins B6 and B12 reduce levels of homocysteine, a toxic amino acid linked with an increased risk of Alzheimer’s disease. Choline helps support memory, strengthening the hippocampus, and helping to create acetylcholine: the ‘learning transmitter’. Increased acetylcholine allows for faster cognitive processing and this is where many of the Nootropic effects of choline come from. According to the University of Maryland Medical Center (UMM), “Gingko is widely used in Europe for treating dementia.” Doctors started to use it because they thought it improved blood flow to the brain, but more recent studies indicate it may protect nerve cells from damage in Alzheimer’s. Benefits may include improved thinking, memory social behavior and ability to perform everyday tasks. Brain damage from oxidative stress and free radicals can be lessened through a diet filled with antioxidant foods, primarily plant foods rich in phytonutrients. In the 1950s, neuroscientist Brenda Milner made a revolutionary discovery that memories are formed in the hippocampus. This groundbreaker, who still works as a professor at McGill University in Canada, told AARP how she keeps her own brain sharp at age 99 (2). Memory loss is a natural byproduct of age, but it doesn’t have to be, adds Dr. Frank King, who in his mid-60s is the founder and president of Dr. King’s Natural Medicine, Asheville, N.C.
“We are restorative beings,” King says. “We are designed to restore and rebuild. That old school thought was that once you had nerve damage it was for good. More and more research dispels that old myth. Researchers at the Rush Institute for Healthy Aging in Chicago found that those consuming the highest amounts of trans fats have a five-times higher incidence of Alzheimer’s disease (3) . However, not all fats are created equal and it’s the essential fatty acids found in omega-3s that are fundamental to brain health. Found in fatty fish such as tuna and salmon, they are also available through supplementation. Omega-3 fatty acids protect the meninges surrounding the brain from damage and modulate inflammation in the nervous system. The essential fatty acids in omega-3s are Docosahexaenoic acid (DHA), Ecosapentaenoic acid (EPA) and linolenic acid. These are the conduits through which neural signals travel. Dietary omega-3 fatty acids from fish, seafood, plants and supplements may help reduce the incidence of depression and other brain-related medical conditions. The optimal balance for brain health is a 1:1 ratio of omega-3 and omega-6. The parent omega-3 fatty acid (alpha-linolenic acid) is found in the oils from ground flaxseeds, canola, walnuts, and a range of dark green leafy vegetables. Folic acid, zinc and selenium are all involved in the conversion of alpha-linoleic acid into EPA and DHA. DHA is increasingly recognized as a protective compound guarding the aging brain cells against damage. A 2000 study in the journal Lipids shows that Alzheimer’s patients’ brains have exceedingly low DHA levels. Bluebonnet Nutrition Corp. of Sugar Land, TX, offers a Power Thought caplet that goes beyond DHA and antioxidant vitamins A, C and E to include such cognitive-enhancing nutrients as phospholipids, amino acids, and herbal ingredients like ginkgo biloba leaf extract. Sugarek MacDonald also considers choline an optimal supplement for the aging brain. Choline is the newest nutrient to receive a Daily Value (i.e. 550 mg/daily) from the FDA. “Choline helps with the communication system for cells within the brain and the rest of the body. [It] may also support the brain during aging and help prevent changes in brain chemistry that result in cognitive decline and failure,” she says. The Brassica family of plants are considered superior detox agents and contain chemicals called glucosinolates that are capable of acting in a similar way to drugs used for Alzheimer’s disease. Another invaluable ingredient supporting cognitive health is curcumin, the compound from turmeric, which when blended with turmeric oil has the ability to cross the brain barrier and reach brain cells. Curcumin protects brain cells from damaging inflammation and has been shown to reduce the beta-amyloid levels and shrink the size of accumulated brain cell signals by more than 30% in experimental models, says Terry Leremond, president and founder of EuroPharma Inc., based in Green Bay, WI. An adult brain contains about 100 billion nerve cells with branches that connect at more than 100 trillion points. Signals travel through this “neuron forest” and nerve cells are the chief type of cell destroyed by Alzheimer’s disease. Ultimately, the brain shrinks dramatically, affecting nearly all its functions (4). Lemerond says someone develops Alzheimer’s disease every 70 seconds. To maintain a healthy brain and slow decline, Lemerond recommends 2,000 IU of Vitamin D3 (as cholecalciferol) taken daily. A clinical study published in the journal Neurology indicated adults with just moderate vitamin D deficiencies had a 53% increased risk of dementia and a 69% increased risk for Alzheimer’s. Next, he recommends 600 mg total taken daily of Curcumin (Curcuma longa) Rhizome Extract, Spanish sage (Salvia lavandulifolia) flower oil and Rosemary (Rosmarinus officinalis) flower oil. Botanicals rosemary and Spanish sage preserve acetylcholine, a messenger in the brain that supports memory and learning. Low levels of acetylcholine are associated with Alzheimer’s disease. Stress, sleep deprivation and many brain-related conditions feed the sympathetic (stress) branch of the nervous system. Sympathetic overdrive promotes brain-related conditions and abdominal adipose (fat) deposition. 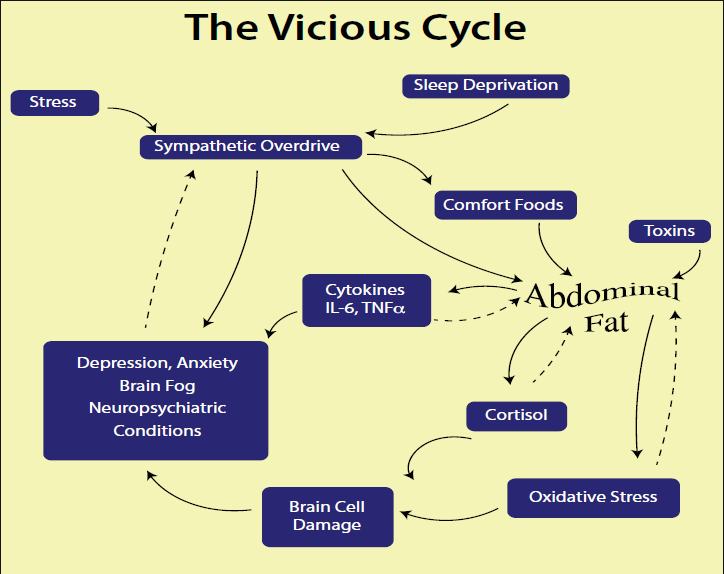 Abdominal fat then adds to the burden of cortisol, oxidative stress, and mood-altering cytokines (immune chemicals). Source: The Brain Diet, Cumberland House, Nashville, TN. And, finally, Lemerond recommends 150-300 mg of the reduced, active form of L-glutathione twice daily. Glutathione protects brain cells as the body’s master antioxidant synthesized from glycine, cysteine and glutamic acid. Rather than oxidized glutathione, he says, the form to try is active glutathione, also known as “reduced” gluathathione. It combines glutathione with protective antioxidants to preserve it from oxidation. “Knowledge of the roles of certain proteins and fats in brain composition and their relationship to the maintenance of physical and functional capacities of the brain is being continually expanded by research,” notes Neil E. Levin, CCN, DANLA, senior nutrition education manager at NOW Foods, based in Bloomingdale, IL. “In combination with these macro nutrients, the role of inflammatory and oxidative factors in the brain are key to understanding the typical progression of age-related cognitive challenges to those brain structures that can subsequently cause a decline in their competent functions. By uniting these concepts of how nutrients support healthy brain structures and their functions, we can maintain cognitive abilities over time as we inevitably age,” he adds. Levin points to supplements such as curcumin with high bioavailability that can pass the blood-brain barrier to support the health of the brain and nerves. Another nutrient magnesium l-theonate supports brain health and may facilitate learning and memory, along with relaxed mood. NOW’s newest brain-supporting product is Brain Attention, a chewable chocolate-flavored tablet made with a silk protein derivative called Cera-Q. Its structure lets it interact with existing brain proteins, Levin says. Resveretrol is an antioxidant that occurs naturally in the skin of purple and red fruits such as grapes, raspberries and blueberries as well as red wine, chocolate and peanuts. One study on a small group of healthy older adults found that taking 200 mg of resveratrol per day for 26 weeks improved memory (5). S-Adeosyl methionine (SAMe) occurs naturally in the body and is useful for improving brain function in people with depression. One study found that adding SAMe to the anti-depressant prescription of people who had previously not responded to therapy improved their chances of remission by about 14% (5). A growing problem, King adds, is overgrowth of bullying candida in the lining of the gut, which kick the good guys and probiotics out. “Certain strains can cause brain fatigue and loss of memory,” he says. “The overgrowth of this candida is affecting 80% of the population and they don’t know it. This is a major pandemic in our time today” leading to increasing cognitive malfunction. Homeopathic remedies include AquaFlora, which contains 22 active ingredients including Abies canadensis, Allium cepa, Allium sativum, Aloe socotrina, Antimonium crudum, Asafoetida, Borax, Candida albicans, Candida parapsilosis, Carpinus betulus, flos, Ignatia amara, Lachesis mutus, Lycopodium clavatum, Malus pumila, flos, Olea europaea, flos, Phosphoricum acidum, Phytolacca decandra, Pulsatilla, Sabadilla, Sticta pulmonaria, Sulphur, Thuja occidentalis. These are designed to attack the “bullying” candida and restore gut health, he says. This then allows probiotics to do their job to maintain the proper digestive balance. Other therapies that can help people with dementia include music therapy with soothing music, pet therapy such as visits with dogs to improve mood, aromatherapy involving the use of essential plant oils, and massage therapy involving touch techniques. Contemporary research confirms meditative practices can improve thinking ability. In addition, they are shown to alter the brain in a way that slows down the aging process. Socialization and relationships help keep the brain connections alive. Socially isolated seniors and those who have lost a spouse are at greater risk for cognitive decline. Milner notes that back when she discovered the link between the memory and the hippocampus, it wasn’t possible to get the kinds of images now readily available to researchers and medical professionals.